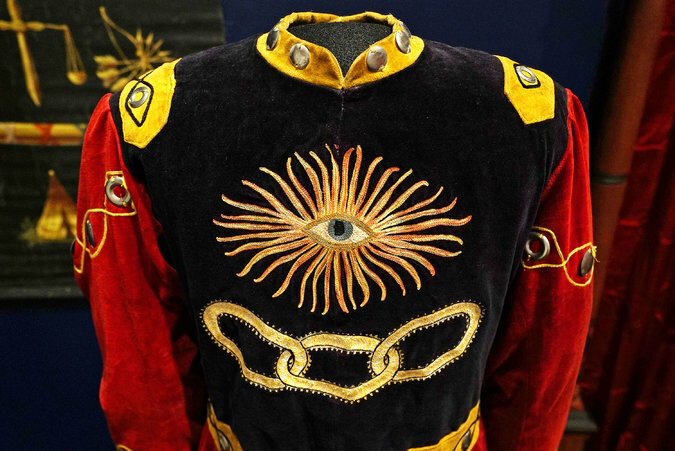 An exhibit featuring folk art of Freemasonry and the Odd Fellows from a private collection in New York City is running at the American Folk Art Museum through May 8th. Masonic and Odd Fellow lodges mushroomed in the United States in the 18th and 19th centuries, giving rise to a fascinating, quasi-religious material culture. That’s the subject of “Mystery and Benevolence: Masonic and Odd Fellows Folk Art From the Kendra and Allan Daniel Collection,” a captivating exhibition at the American Folk Art Museum. Organized by the museum’s chief curator, Stacy C. Hollander, the exhibition features 190 artifacts from a collection recently donated to the museum by the Daniels, who are folk art collectors. Mr. Daniel is also a museum trustee. For the whole article and photos, CLICK HERE. The exhibit is co-curated by Aimee E. Newell, Director of Collections at the Scottish Rite Masonic Museum & Library in Lexington, Massachusetts. The American Folk Art Museum is located at 2 Lincoln Square, on West 66th Street, Manhattan.